KAMPALA- Emma, 17 [not his real name] wakes up every morning, stands along Republic Street in Mbale looking into the skies, talking to himself. At times he becomes violent to whoever is passing by, keeps mumbling before bending to look for something in the garbage heap. But Sheila, 16 [not her real name] wakes up early in the morning, dresses up smartly and goes to Naboa Road also in Mbale; you find her street preaching, occasionally reciting biblical verses that are nonexistent. Sheila doesn’t seem to know anything about the Bible and can’t quote any other part of the Bible, she staggers about shouting, talking to herself and laughing uncontrollably. Clearly, these two are mad but a resident of Mbale, Mr John Nambale says the duo got their mental disorders from consumption of drugs. Emma and Sheila are just a few of the youth whom you will find on the streets of Uganda but there are many such victims in the corporate and professional world and what aggravates their condition is that they will never admit what caused it. Dr Muhammad Mulongo the District Health Officer Bulambuli says because of abuse of drugs, the youth could be living with Bipolar Affective Disorder which causes them to have severe mood swings, moving between elation and despair. Dr Mulongo adds that the two young people are suffering from a mental disorder due to consumption of Kuber and Shisha. According to Dr Andrew Kasolo of Dekar Clinic in Mbale, Kuber is a central nervous system stimulant that causes euphoria and is also associated with anxiety, depression, panic, paranoia, hallucinosis, low energy, Psychosis and memory impairment in the short term but damage to teeth, gum inflammation, bad breath, and throat cancers may occur in the long run. Dr Caroline Birungi, a Psychiatrist and lecturer at the Department of Psychiatry at Makerere says available WHO reports associate Kuber with dizziness, headaches, sleepiness, weak teeth, gum bleeding and cancer. “There are serious consequences that come with the consumption of Kuber because it has tobacco in it and people are misinformed about the dangers of prolonged use of it,” she says. Birungi further cautions that Kuber is a cause for concern because of the mental health issues associated with it like impairing memory and causing depression, even mere addiction to it is a mental problem. The executive director of Mental Health Uganda, Dr Julius Kayiira, describes mental illness as a medical condition that disrupts a person’s thinking, feeling, mood, ability to relate to others and daily functioning. Dr Kayiira says the Ministry of Health’s mental health unit estimates that about 7million people in Uganda suffer some form of mental disorder. Mr Haruna Nyanzi, a specialist practitioner and researcher in mental health based in the UK, agrees with Dr Kasolo that Kuber causes psychosis and describes the condition as a form of mental disorder where someone’s emotions are so impaired that one loses touch with reality. World Health Organisation at WWW.cancer.org classifies Kuber as smokeless tobacco and a major contributor to morbidity. Globally, the WHO estimates that tobacco causes about 71% of lung cancer, 42% of chronic respiratory diseases, 20% of global tuberculosis incidence and nearly 10% of cardiovascular diseases. Kuber is chewable tobacco, rich in nicotine, which is labelled as a breath freshener and sold in shops in plastic sachets for as little as Shs 200, Shs 300 and Shs 500. The price of Kuber, a dangerous drug being widely consumed by school children and taxi drivers among others is one of the reasons many are hooked. It is undetectable because it has no smell, so caretakers like teachers, parents or even employers cannot easily catch its consumers. Doctors say that Kuber has a stronger effect on the user than Marijuana, When ingested, the user takes in three to four times more nicotine than cigarette smokers, making it extremely addictive and that the amount of nicotine released into the body tends to be much greater than when inhaling tobacco smoke, which is what makes Kuber more addictive than cigarettes. The government of Uganda in October 9, 2013 banned the use of Kuber, Shisha drugs, disguised as mouth fresheners from being sold freely on the market but there is little if anything being done towards sensitizing the public about the dangers of Kuber. And there seems to be no strict law put in place to ban the importation of these drugs. Although government’s response to Kuber remains low since its ban and may be a painful struggle, as 2018 slams its doors, we should not ignore the fact that Kuber remains a health hazard that requires urgent government attention. Reports indicate that Kuber is imported as a mouth freshener, so it goes on the market without approval of the National Drugs Authority because the manufacturers never disclose the ingredients of the sachets. Dr Kasolo says that Kuber also contains drugs like cocaine and marijuana which may lead to hormonal change, impaired brain development, mental health disorders and heart problems. “And you know the ingredients are written in foreign languages which may not be understood by the consumers so the youths who take it don’t really understand what they are doing. This drug is on sale in many Indian-owned supermarkets as a smokeless product that contains tobacco,” said Dr Kasolo. Dr Birungi says the health studies have revealed that the drug which is openly sold as “an appealing fragrance which will please your senses contains 28 cancer causing agents. “We know that the contents are tobacco but there seems to be other contents written in the Indian language which we don’t understand, these could be disastrous that is why government banned it here,” said Dr Birungi. Today, in the villages, town centres and municipalities, more than half of the youths access Kuber from Indian shops and supermarkets and smoke it in schools. Dr Gideon Wamasebu the Manafwa District Health Officer, says Kuber is a deadly stimulant drug, widely being abused by students in primary and secondary schools and idle youths desperate to get ‘high’. Apart from merely condemning sale of Kuber in Uganda, our government should widely publicise the dangers posed by exposure to Kuber and other smokeless tobaccos on market and provide guidelines, standards whatsoever regarding use and disposal of smokeless tobacco. Kuber is believed to be manufactured in India, initially sold and consumed by Ugandans of Indian origin and is now being imported dubiously into Uganda without the consent of government, it has today infiltrated schools through the black market. A parent who visited this reporter, Mr Deo Matsanga whose child has been a victim of Kuber says he was called last year while in Kampala and told that his child was sick, unable to talk, walk, eat and could not sleep for the past two days and that he constantly complained of headache. “When I went to the school, I found my child in bed, I straight away asked him what had happened and he told me that his friends at school had been given him Kuber to put under his tongue,” said Mr. Matsanga. The Police Commissioner in charge of Narcotics, Mr James Kyomukama said that Kuber is an issue of national concern for everyone and added quickly that police will do its part to investigate how the drug comes into the country to stop it. “And such cheap stimulants come with severe adverse effects besides their addictive nature. We are going to put a ‘red flag’ on it and move fast to end its sale anywhere,” said Mr Kyomukama. Reports reveal that Kuber like the Indians themselves who are everywhere in the eastern part of the country finds its way into Uganda through the porous border points along the Uganda-Kenya border. 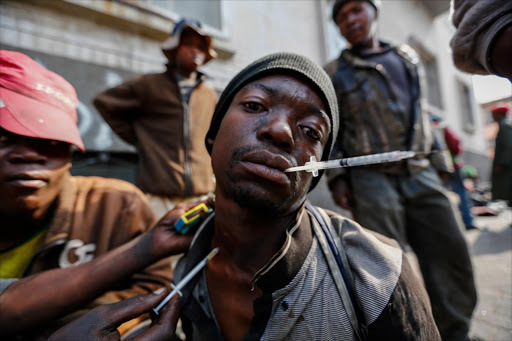 The deputy police spokesperson Mr Fred Enanga said police has decided to integrate sensitising people about the drug in the community policing programme but called for concerted efforts to end the importation of Kuber. “It is going to be difficult to track this drug because Indians seem to be using Ugandans to cross it to Uganda from Kenya, so we need cooperation with our neighbouring countries to end this problem,” said police spokesperson Mr Fred Enanga, the deputy police spokesperson. America’s National Cancer Institute classifies Kuber as smokeless tobacco, which it says contains 28 cancer-causing agents. It adds that users take in four times more nicotine (the addictive substance in tobacco) than cigarette smokers.